Cooking a bird the size of a basketball can be a little intimidating, after all, how often do we get to practice?! My first tip is simple – don’t fear the bird! It’s really not much different than cooking a chicken. Read on for a tips and variations and get ready for the best turkey ever! Brining is a process where meats are soaked in a sweet and salty bath and osmosis naturally draws the higher sodium water into the bird, seasoning it on the inside and raising the moisture level. It’s not necessary, but I love the flavor, juiciness and extra browning it provides. We offer three ‘instant’ Tony’s Brine Mixes; classic Pork and Poultry, herbal Italian or Mulled Brine (with warm mulling spices). You can also find a Homemade Brine Recipe here. 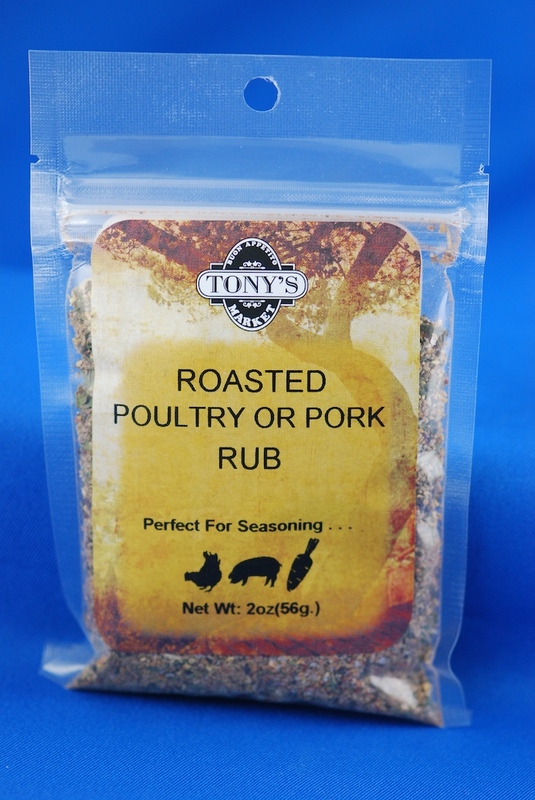 If you love turkey skin with an encrusted seasoning, use our Roasted Poultry or Pork Rub, it’s perfect! Just sprinkle it on the damp skin (or oil lightly first) and then mist the seasoning with oil to keep it in place. Previously labeled “Turkey Seasoning”, we changed the name because it’s also incredible on Pork, Chicken, Goose and Pheasant, as well as roast vegetables, dressings and more. If you don’t want an encrusted seasoning, stick to salt and white pepper, or choose a finely textured seasoning blend. Your holiday turkey will cook more evenly unstuffed – by the time the stuffing has reached a safe temperature, the breast is usually overdone and dry. If you do choose to stuff, use hot dressing immediately before roasting and inverted roasting to even out cooking. If you roast dressing on the side, dot it with plenty of butter and splash with plenty of turkey stock for that ‘roasted in the bird’ flavor. The thigh and hips of the bird take much longer to cook more than the breast, so cooking inverted for the first 2/3 – 3/4 of the cooking time aids in even cooking. Turn the bird breast side up near the end of cooking for better browning and presentation. Checkout the video above for step-by-step brining and cooking directions – and find my written roast turkey and gravy recipe here. Spatchcock (AKA Butterflied) and cut-up turkeys cook fast and taste great! Removing the back and flattening out the turkey increases the browned surface for a more roasty (or smoky) flavor, and greatly shortens cooking time. Cutting the turkey into pieces shortens cooking even more. For a nominal fee our butchers can Spatchcock or cut up your turkey, just ask! Here is my Spatchcock Turkey Recipe. No matter how much experience you have, if you want your turkey or roasts cooked perfectly, you need a reliable meat thermometer. Considering the cost of a great roast, a reliable meat thermometer is best investments you can make! If you already have a thermometer, it should be tested and calibrated. 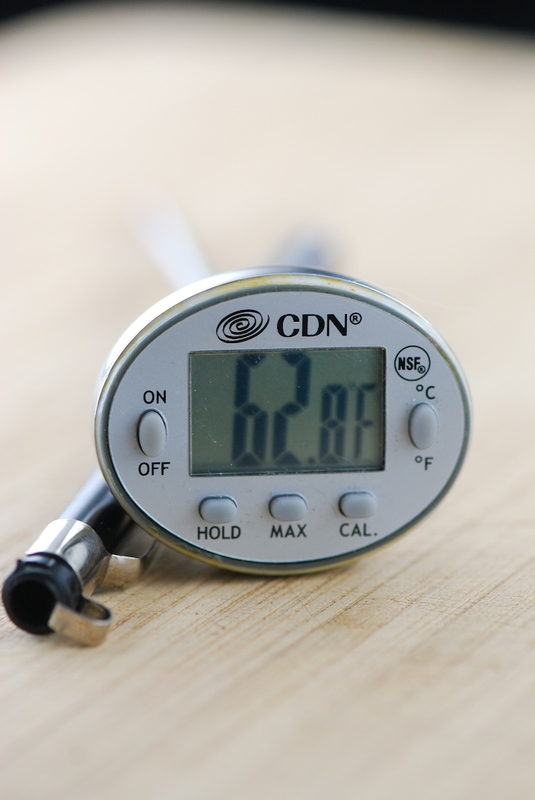 Visit this page for everything you need to know about Meat Thermometers. 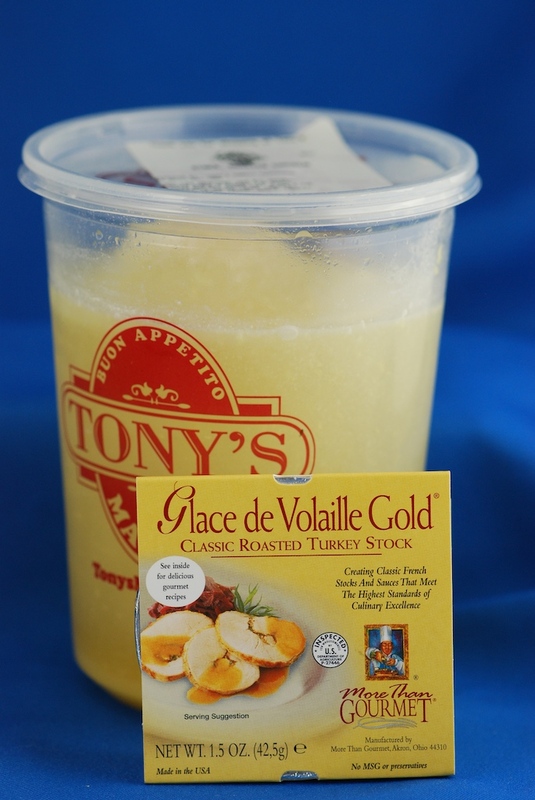 Tony’s Heat-n-Serve Gravy: Made with both turkey and vegetable stock, no gluten ingredients and a hint of Marsala, our heat and serve gravy is delicious! Simply warm, whisking well, and serve. With great pan drippings, a little understanding of thickeners and plenty of great stock, great gravy is a snap. We offer a limited quantity of homemade stock and the best tasting concentrated poultry stocks in More Than Gourmet’s Glace di Voilalle (roasted turkey stock) or Glace de Poulet (roasted chicken stock). Great stock is also easy to make at home, get my turkey stock recipe here. I’ve compiled all my favorite holiday recipes on our Holiday Roasting Tips Page; and it’s loaded with excellent recipes for Turkey or Turkey Breast, Standing Rib Roast, Ham and Pork Roasts, Lamb and a host of side dishes. There are also videos for brining and roasting turkey, making gravy and also roasting Prime Rib and Tenderloin Roasts. Bookmark and share the page now! The Thanksgiving meal is both savory and sweet, so your normal favorites may not be a good match. The best wines for the Thanksgiving feast tend to be off-dry to sweet Riesling or Gewurtztraminer from the Pacific Northwest or Germany. American sparkling wines are also a great choice for both before and during the meal. Red wine lovers, look for fruit-forward wines with low tannins such as Pinot Noir, Beaujolais and California Red Zinfandel. Personally, I like to open a variety of wines and turn it into a wine tasting for some tasty mealtime conversation and discussion. Get recipes for Turkey Fried Rice, Pot Pie, Soup, Tetrazzini, Lasagna, Tacos and more! Start with great ingredients, a good thermometer and if you have any problems, come back to this page for tips. You can handle this; just stay relaxed and attentive, watch the videos above, and always remember what you are thankful for – the guests sharing your table! If things don’t go as well as you like, shake it off and don’t apologize so everyone can be comfortable and have a great time – including you! Happy Holidays and Buon Appetito!